Personalized gifts show the recipient that you know them and you bought the gift specially for them. It doesn’t have to have their name or their picture on it to be “personal? 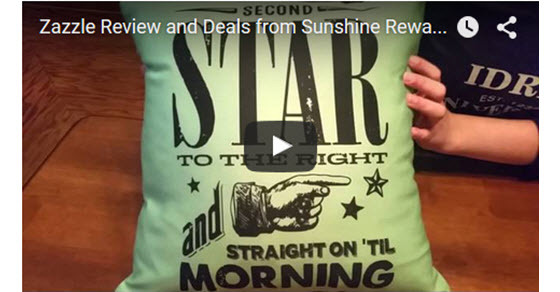 In fact, Jillian and I spent some time on Zazzle looking for gifts that would be personal for HER specifically to do this video review. You could find something for everyone on your shopping list! As you can see in the video, Jillian chose a pillow and a shirt. She also demonstrates some of the gifts I have gotten her from Zazzle in the past including playing cards and a mug. Each item revolves around something she loves. The pillow has “Second Star to the Right and Straight On ‘Til Morning” printed on it because she is a huge Peter Pan fan. The shirt is “Idris” from the Shadowhunters books (you can see her Shadowhunter blog to see how obsessed she is!). The cards are also Shadowhunters and the mug is Beauty and the Beast. I’ve started ordering her gifts from Zazzle every year because I can customize them perfectly depending on what movies or books she is into at the time. They also run really great specials (up to 50% off different items on different days). If you are looking for great customized gifts, first hit our Zazzle coupons page and then from there check out all of the incredible items they have on their site. If you need ideas, watch Jillian’s video below.